Home/Science & Technology/Junk DNA? Or Does It Reveal The Source Of Our Mind & Intelligence? But this one seems to be what distinguishes us as “human” and may correspond to greater brain functionality. In fact, we possess more than twice the amount of replications (copies) of this protein as a result of the instructions (code) of our genome than our nearest genetic relative –the chimp. It seems to be clearly related to the growth of certain parts of the brain –and presumably to more sophisticated neural networks. 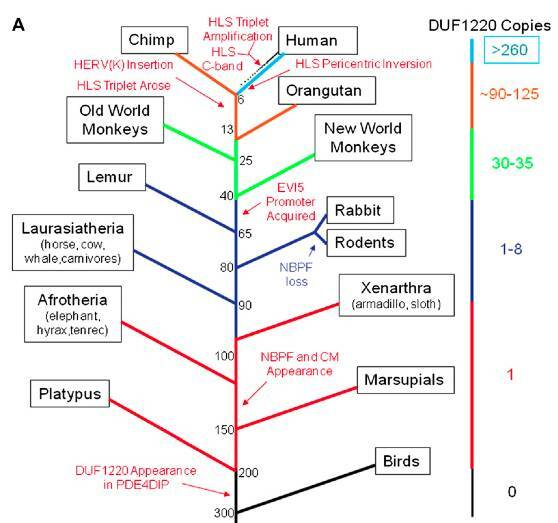 “DUF1220 is a protein domain of unknown function that shows a striking human lineage-specific (HLS) increase in copy number and may be important to human brain evolution. The copy number of DUF1220 domains increases generally as a function of a species evolutionary proximity to humans. DUF1220 copy number is highest in human (over 270, with some person-to-person variations). and shows the largest HLS increase in copy number (an additional 160 copies) of any protein coding region in the human genome. DUF1220 copy number is reduced in African great apes (estimated 125 copies in chimpanzees), further reduced in orangutan (92) and Old World monkeys (35), single- or low-copy in non-primate mammals and absent in non-mammals. First, how and why did our copies of this particular “line of code” simply double at one point in our evolution? Can this be attributed to mutation or chance? And perhaps more important – this is code that no human originally wrote – not like Microsoft Word or Photoshop – which was written by human programmers. Obviously, this particular bit of “software” has intention and meaning –it actually created the capacity of a brain to eventually write the code for Microsoft Word or Photoshop! While plausible on many levels, there is no direct evidence for this at this point. And it begs the question – where and how did these “aliens” evolve? The ONLY direct evidence that exists is this –we now KNOW that something akin to the software humans now creates is operational within our organic being. Of course, this has profound implications for our personal ego, as pointed out by thought leaders like Eckhart Tolle. Our cosmology would also open immensely. With the primacy of intellect and mind now apparent, we might begin to intuit what “dimensions” actually represent – levels of mental acuity that open to us only when a certain level of being (physiologically, psychologically and chemically) is attained. This would begin to account for experiences with ESP, drugs, past lives, near death and all kinds of other mental realities which our material science cannot begin to address. As Eckhart Tolle says, death is not the opposite of life, birth is the opposite of death. Birth and death are both parts of an inconceivably intelligent reality which we experience as Life. Does this mean that we should not, as a species, follow our discoveries in this area and begin to affect our own evolution? Let’s face it –the genie is out of the bottle. I would suggest that we have an imperative to do so –but to do so consciously with a profound reverence for higher levels of meaning and intelligence that we will ultimately encounter. This is why the ancients merged science with a sense of the Sacred –because there needs to be a profound relationship of surrender and humility in the face of this recognition. Our entire notion of a “mastery” over Life must be seen as nonsensical, along with all of the other trappings of our conceptual “understanding” of a reality that cannot be “explained” in our own human terms. Seeing our minds as a “work in progress” and not the be all and end-all of evolution, we might begin to question everything –including the veracity and even the significance of our own thoughts –which to this point have been the only Mind we’ve ever known. Instead, upon more direct examination, we must comprehend that we are merely a tiny fraction of All that exists, of an Intelligence that encoded our genes, in the same way, that we have encoded our intelligence into computers. In our current level of being, we cannot begin to comprehend this intelligence – that is why so many of us simply “worship” It. But just because Life is expressing a level of being an intelligence far beyond anything we can currently comprehend does not mean we should simply accept “not knowing” and surrender completely. It means that we need to study what “knowing” truly means and perhaps as T.S. Elliot said, we can return to the present and begin to truly know it for the very first time.